A large owl with a round head, no ear tufts and a long tail. Primarily gray and brown with white bars, under parts are buff with vertical streaks. Eyes are dark brown, beak is yellow or white and almost covered by feathers. They weigh between 1 and 1.5 lbs. and have a 3 to 4 foot wingspan. Mature forests and heavily wooded swamps. They roost in densely forested areas and hunt over farmland, open country, roadsides and rivers. Eastern United States, north into Canada and south into Florida and Texas. They are also found in the Pacific Northwest. Insects, amphibians, reptiles, birds and mammals, including woodchuck, geese and herons. They are opportunistic hunters and will often eat easy-to-catch prey such as lizards, frogs and small rodents. 15 years in the wild, up to 30 in captivity. They establish long-term pair bonds. 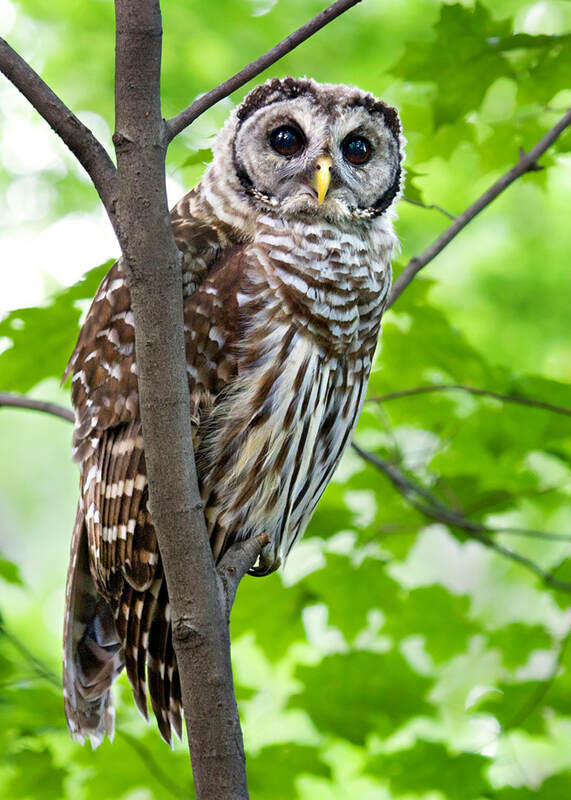 These owls nest in abandoned hawk or crow nests, large, deep hollows in trees or nest boxes. They lay 2-3 (rarely 4-5) white eggs. Incubation is all done by the female and lasts approximately 28-33 days. The young fledge at 6 weeks old. ​This owl is often heard calling “Hoo-hoo-to-hoo-oo, hoo-hoo to wha-aa” which sounds like “Who cooks for you, who cooks for you all?” These owls are very vocal during the breeding season of February and March and also during late summer into early fall. They are one of the few owls that can be heard during the day as well. 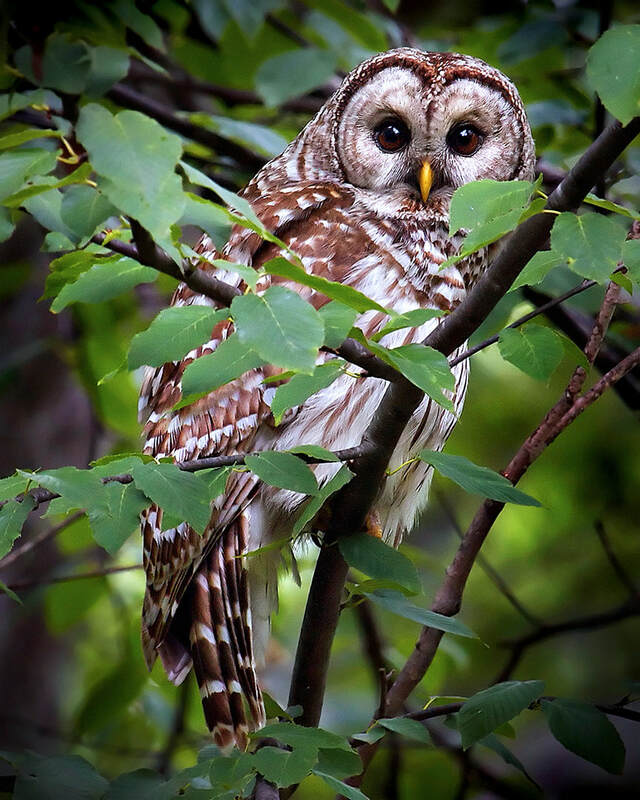 The name barred owl comes from the beautiful brown and buff vertical color streaks or bars on their chest. 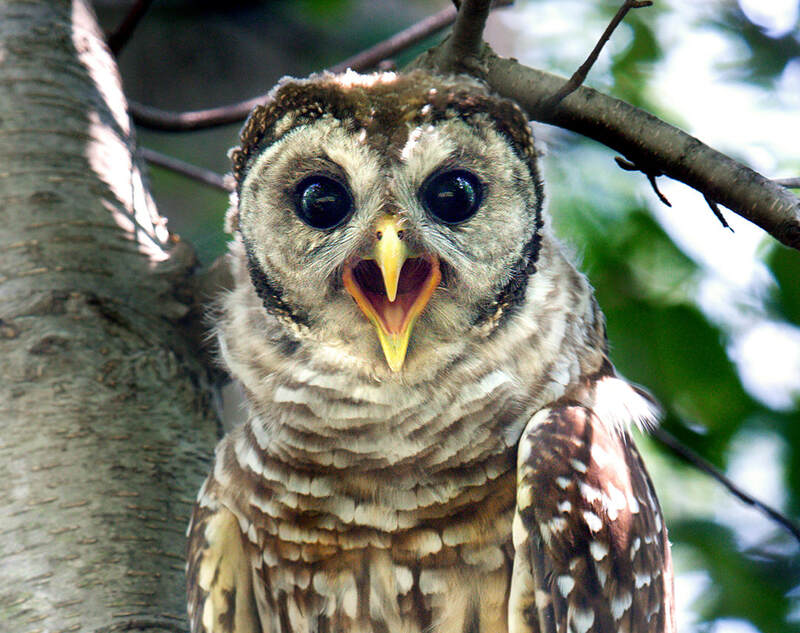 The Zoo’s barred owl was injured in the wild. She was found in Southbury, CT, and taken to a wildlife rehabilitator. She has a cataract in her left eye and a damaged left wing and therefore would not survive in the wild. She is on exhibit at the Zoo along the Hoofed Stock Trail near the bison.